Work Parties will engage participants in a range of infrastructure and site improvements. We will work on a variety of projects including trail work, planting, mulching, mushroom inoculation, and more. 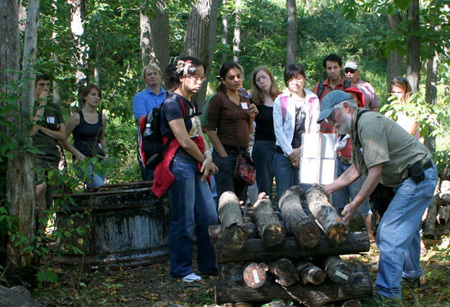 The Nut Grove is maintained by Professor Ken Mudge and extension Aide Steve Gabriel along with student workers and volunteers. In addition to conducting agroforestry research at Cornell, Ken and Steve are co-authoring a book on the subject, see www.FarmingTheWoods.com. The work parties are free and open to the public. We ask that you come prepared to work in the fall weather. Please wear close-toed shoes and bring water to drink.